This blog is for us, the people of San Pablo and guests, to share information and concerns about our city, our government, our schools, our neighborhoods, our businesses, our religious centers, and any and all issues we deem important. It is also for us to ‘talk back’ to each other and government about the issues and questions that concern us. We commit to be respectful of each other. There is much we can accomplish working together. RICHMOND — After weighing the pros and cons of cutting the costs and scope for a proposed $1 million forensic audit of the West Contra Costa school district bond program, a committee decided to recommend paying for the whole kit and caboodle. The district’s Dennis Clay subcommittee, which is tasked with looking into the former project analyst’s allegations of financial mismanagement, debated a little more than three hours Monday night before deciding it was best to not cut corners on the breadth of the forensic audit recommended by auditors Vicenti, Lloyd & Stutzman. The $1.6 billion bond program has already undergone heavy scrutiny and the detailed investigation would delve into areas beyond Clay’s allegations of fraud, waste or abuse. Some members of the school board, and even some bond critics, have expressed concern that $1 million is too much to pay, but in the end, the subcommittee voted 2-1 to forward the full proposal as well as an additional $168,000 in legal expenses associated with the audit. It also voted to empower subcommittee legal counsel James Kawahara to attempt to negotiate lower fees with forensic auditors, said district spokesman Marcus Walton. The audit would include an accounting of historical transactions and a testing of the district’s internal controls, which were identified as having high to medium risk of possible waste, fraud, abuse or financial irregularity, said audit team spokesman Ernie Cooper of VLS. School trustee and subcommittee member Valerie Cuevas voted for the full accounting. “While I would not prefer that be the cost, there is no price on making sure that we have the community trust, transparency and equitable resources necessary, so that folks continue to trust us,” she said Tuesday. Since the voters will need to pass a similar bond measure to complete school construction districtwide in the future, it just makes sense, she said. “I can’t go and ask them for these dollars if these questions still linger,” she said. Cuevas’ motion was seconded by school trustee and subcommittee member Liz Block. The third subcommittee member Ivette Ricco, who is also chair of the Citizens’ Bond Oversight Committee, voted against the full scope of the audit. She said in an email that she recommended modifying the scope of the audit to save bond funds and time, so it would focus specifically on the Clay allegations made in April 2015. Tom Panas, a member of the district’s Citizens’ Bond Oversight Committee, said the price tag for the audit would actually only amount to one half of a tenth of a percent of the $1.6 billion bond program, which is a very small price to pay to ensure future mistakes be prevented. The full scope of the audit would look at past concerns such as how the contract with SGI Construction Management, the firm that oversees the bond program, was approved on October 2013, and whether it and the district’s architects, WLC Architects, were paid appropriately. In addition, it would test present-day controls to determine the adequacy and appropriateness of the Citizens’ Bond Oversight Committee, the Bond Program steering and prioritizing committees, and the district’s Governance Handbook, to name a sampling. The school board will vote on whether to approve the subcommittee’s recommendation at its Jan. 20 meeting. Superintendent Harter must go !! This photo of Bruce Harter, Superintendent of Schools West Contra Costa Unified School District, was taken at Contra Costa College in San Pablo on Feb. Early findings of a forensic audit examining the West Contra Costa school district’s $1.6 billion bond construction program provide further evidence that Superintendent Bruce Harter must go. “There appeared to be a disdain for internal controls, coming from the top, which allowed internal controls to be circumvented or overridden,” said auditor Ernie Cooper. But West Contra Costa school trustees are instead considering granting another extension of Harter’s sweetheart contract, this time until June 30, 2019. That’s right. Four more years of incompetent leadership. It outrageous. The best hope for replacing Harter with a fiscally responsible administrator apparently lies with the 2016 school board elections. Harter keeps his job with the slim support of three of the five trustees. Two of his backers, Todd Groves and Randall Enos, face re-election next year and must be replaced if they insist on keeping Harter. It’s time to end the mismanagement and hold leaders accountable for wasteful spending. The forensic auditor’s early findings help explain why the school district with the largest construction program in the state except Los Angeles and San Diego doesn’t have enough money to finish the job. They help explain why West Contra Costa property owners pay the highest school bond tax rates in the East Bay. Yet district officials want more. Harter isn’t the only culprit. Former trustee Charles Ramsey meddled where he didn’t belong, lacked fiscal discipline and financed his political campaigns with contributions from bond-program contractors. But it was Harter who was supposed to ensure that the construction was professionally managed and insulated from political influence. Instead, he marched side by side with Ramsey, misleading the public about the costs and turning a blind eye to transgressions. Harter was supposed to be the grown-up in the room. He’s the highly paid professional with a”‹contract that provided $354,500 in annual salary and benefits in 2014. On top of that, he’s guaranteed 18 months’ severance if he’s fired. That’s ridiculous. After Jan. 1, state law will forbid such a lengthy buyout clause. But Harter has enjoyed it since 2006, providing him amazing job security. All the more reason he should have stood up to Ramsey and protected the integrity of the bond program. The long-overdue forensic audit has just begun. We suspect we have seen only the beginning of the revelations. While awaiting findings, the last thing the school board should do is extend Harter’s contract. His mismanagement has already cost the district dearly. It’s time for trustees to show him the door and move on. RICHMOND — West Contra Costa trustees will seek a detailed audit of their bond construction program in the wake of whistle-blower allegations of criminal wrongdoing and negligence by three district officials. Dennis Clay, a project analyst who has worked in the district for 11 years, alleged in a document sent to the board earlier this month that he had uncovered evidence of criminal conduct by former Trustee Charles Ramsey, “facilitation” by Superintendent Bruce Harter and negligence by Sheri Gamba, associate superintendent of business services. Clay who performs financial analysis for the district, said Wednesday that he compiled three binders full of documents to back up his claims, which he provided to outside auditors from Pleasanton-based Vavrinek, Trine, Day and Company. “I had hoped that (the company) would use the documents given them in more than a cursory way,” Clay wrote to the board. “Like the auditors before them, Total School Solutions, they did not show much understanding, nor interest in the operational issues and complications involved in running a billion dollar bond program …” Clay said that he wants to discuss his allegations and documentation with the independent Citizen’s Bond Oversight Committee or its Audit Subcommittee, if the district will allow that. District spokesman Marcus Walton said it was his understanding that the board is hiring the auditors to conduct the independent investigation. He also said that Clay did not need the district’s permission to talk about his documentation. Groves said after the closed session that the district is taking whistle-blower protection laws seriously and that he hoped the board would be ready to discuss its plans for a forensic audit at its May 6 meeting. A forensic audit is a much more detailed examination of the finances of the bond program. During their closed session, trustees met with two outside lawyers, but excluded Harter from most of the meeting without publicly stating why the superintendent — who normally attends closed sessions — was not allowed to participate in a large portion of the discussions. Ramsey, reached by phone late Wednesday afternoon, called the allegations “serious,” and said that Clay “would have to back them up.” He would not comment further and referred questions to his attorney. Several district residents who asked the board for an independent analysis of bond spending after learning of Clay’s allegations praised trustees for taking the matter seriously. The residents said transparency is necessary to rebuild public trust in the bond program. “This independent forensic audit is a HUGE step forward to shining light on the financial irregularities in the construction program,” said resident Ben Steinberg, in an e-mail to this newspaper. Hercules City Councilman Dan Romero, who reminded the school board about whistle-blower protection laws before they went into closed session, said in an e-mail after the meeting that he was glad to hear the board would pursue a detailed audit. “This is a huge step to transparency that residents in West County have not seen in over a decade,” he said. Trustee Madeline Kronenberg said after the closed session that the FBI, which initially contacted her in relation to an SEC investigation into the bond program last fall, has not followed up with her. Trustee Val Cuevas said that the SEC investigation is ongoing. more Information To see whistle-blower documents, a letter from district residents seeking a forensic audit and a video clip from the meeting, visit http://www.contracostatimes.com/education. Superintendent Bruce Harter should be fired !! As the veil lifts slightly on West Contra Costa’s $1.6 billion school construction bond program, the extent of mismanagement becomes apparent. The person at the helm during years of uncontrolled spending, Superintendent Bruce Harter, should resign. If he doesn’t, the school board should take the more costly, but necessary, step under his sweetheart contract: Fire him. In a district with major pockets of poverty, property owners pay the highest school bond tax rates in the East Bay to fund a construction program larger than any district except Los Angeles and San Diego. In 2010, Harter and then-Trustee Charles Ramsey, seeking support for the district’s fifth bond measure in 12 years, assured that it would provide the money needed to complete the massive rebuilding project. Yet the district pushed through a sixth measure in 2012 and tried unsuccessfully for a seventh in 2014. Voters rejected the latter after Associate Superintendent Bill Fay acknowledged there were no cost controls. For telling the truth, he was pushed out, although paid to keep silent. The district agreed to keep him on payroll until September 2015 if he said nothing disparaging. His replacement, Lisa LeBlanc, just a few months on the job, has been refreshingly transparent. Her message: There’s not enough money to finish all the construction promised. Criteria are needed for selecting the schools that will get the remaining funds, she says, stating what should have been obvious years ago. There are no criteria because Harter and Ramsey made promises without planning how to fulfill them. Instead, they assumed they could keep seeking more tax increases — and continue deceiving voters each time about the construction program’s total cost. To be sure, Harter had to deal with Ramsey, a micromanaging trustee who thankfully gave up his seat last year to run unsuccessfully for Richmond City Council. Nevertheless, Harter had a professional responsibility to mind the purse, to provide the school board, the bond oversight committee and the public with meaningful analyses of the spending. Instead, Harter and his staff stonewalled. Extracting basic information such as square footage construction costs is nearly impossible. A 2013 audit dinged the district for disproportionately spending on architectural, engineering and management costs rather than direct construction. Poor advance planning and excessive changes drove up those “soft” costs. Several recipients of that money have contributed big sums to the bond campaigns and trustees’ political campaigns. And the trustees have continued to renew Harter’s outrageous contract, which contains an 18-month severance provision. We expect to eventually learn if any of this crossed a legal line because the FBI and the Securities and Exchange Commission are investigating. Legal or not, the district under Harter’s leadership has flunked the fiscal responsibility and transparency tests. It’s time for new leadership. According to todays West County Times, the interim CEO, since 2011, Dawn Gideon will be stepping down as of Feb. 1. She’ll be leaving a salary of $40,000 per month. With all the crying about the hospital not having enough funds to stay open, it doesn’t look like any one at the top is having any trouble collecting big salaries. It’s no wonder their in the hole for 18 million dollars per year. They probably need half that money to pay their doctors and administrators. These salaries are pretty outrages. It’s time to call it a day with Doctors Hospital. It’s time for these clowns to leave. What we need is an emergency room that can handle emergency cases, not a big out dated hospital in need of earthquake retrofitting that insists on paying their doctors and administrators outrages fees. *Read the entire article in todays West County Times. Fortunately, three solid school board candidates seek to bring change, restore fiscal discipline to the district, focus on the needs of the students and give teachers the support they need to educate children. MARILYNNE L. MELLANDER – CANDIDATE FOR DIRECTOR W. CONTRA COSTA HEALTHCARE DIST. 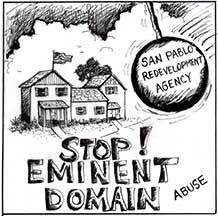 I’ve owned a home in El Sobrante since 1978. My property taxes have more than quadrupled since that time. West Contra Costa Healthcare District (District) formed in 1954 to serve insured community residents. Doctors Medical Center (DMC) serves indigent and uninsured patients. However, District taxpayers have continued to fund what now operates as a County hospital. In spite of calls by property owners, the nurses union and now the Richmond City council to have the County absorb this hospital, Dist. 1 Supervisor Gioia insists this is not financially feasible. Regardless of what happens to DMC, District taxpayers will be saddled with debt for decades to come. The County has made three transfers of District taxpayer ad valorem taxes totaling $42.8 million without a public vote. There has never been citizen oversight on this District in spite of 2011 parcel tax ballot language. I believe citizen taxpayers are important “stakeholders” in all discussions to determine the future of DMC. If elected, I intend to represent the interests of District taxpayers. The Security and Exchange Commission is investigating West Contra Costa’s School Bonds. Subpoenas have been served and the head of the school board, Charles Ramsey has been subpoenaed. RICHMOND — The West Contra Costa school board will pay to defend the board president in an investigation by the Securities and Exchange Commission related to financing for the district’s construction program. Trustees voted in closed session Wednesday to pay legal costs for board President Charles Ramsey, who was subpoenaed Aug. 1 by the SEC, along with the district, county treasurer-tax collector, some members of the district’s financing team and some of its consultants and advisers. The subpoenas were listed in a supplemental disclosure for the district’s sale of nearly $77.5 million in bonds through a negotiated refinancing deal that was finalized Wednesday. Ramsey referred specific questions to his attorneys, Amy Craig and his brother, Ismail Ramsey. His attorneys declined to comment about the investigation. Since 1998, West County voters have approved six bonds worth $1.6 billion to finance the third-largest school construction program in the state, behind San Diego and Los Angeles. The district has issued about $1 billion, with nearly $600 million remaining. The district subpoena requested documents relating to bonds issued from 2009 through 2013, and records related to current and proposed bond refinancing. In June, the board approved a resolution authorizing its financial underwriters to refinance up to $100 million in previously issued bonds. In July, the board directed underwriters to only sell about $50 million and to hold off on the rest until next year or later. The underwriters sold $77.5 million in bonds at a lower rate. Ramsey said Thursday that despite the board’s direction, the underwriters had authorization under the resolution to sell more than $50 million if district goals were met. The SEC characterized its investigation as a “nonpublic, fact-finding inquiry.” The commission’s enforcement division can recommend civil actions in federal court or before an administrative law judge and can impose sanctions, including fines, according to its website. It also works with other law enforcement agencies on criminal cases. District resident Linda Ruiz-Lozito questions whether the district will continue paying legal costs for Ramsey after his term expires in November. Trustee Todd Groves said it made sense for the board to pay Ramsey’s legal costs, which were not disclosed. Theresa Harrington covers education. Contact her at 925-945-4764. Follow her atTwitter.com/tunedtotheresa. TIME TO DUMP RAMSEY !! Contra Costa Times editorial: Which part of “no” do West Contra Costa school officials not understand? Actually, Mr. Ramsey, the ballot did not have a “ask me later” option. The choices were either yes or no. And 54 percent of voters said no to a school construction program that has spiraled out of control. They said no to a district that has issued more construction bonds than any California K-12 district except the much larger Los Angeles and San Diego districts. They said no to increasing the program from an already unconscionable $1.6 billion to $1.9 billion. West County residents, already paying the highest property tax rates in the county, said no to expanding a building program that has no cost controls, in which the projected price of a high school is four times the 2013 median from a survey of the California-Arizona-Nevada-Hawaii region. And they said no, Mr. Ramsey, to your sleazy leveraging of the school-building program to bolster your political career, most recently to fatten the coffers of your Richmond mayoral campaign with contributions from contractors, architectural firms and labor groups that benefit from the construction. Voters understand that children deserve good schools. But they also realize that there are trade-offs, that if you tap out taxpayers to build classrooms they won’t be able to help fund teachers. Unfortunately, Ramsey’s political spin, suggesting that voters might approve more bonds later, appears to be an excuse for continuing the district’s profligate ways. He doesn’t get it. The voters’ message was clear: It’s time for district officials to start living within a reasonable budget, to practice the sort of financial responsibility we should be modeling for our children. Of the $1.6 billion of bonding authority already approved, the district has used about $1 billion. It’s time for them to figure out how to complete the program with the balance. After all, Superintendent Bruce Harter, when seeking support for the 2010 measure, said that would be all the district would need. Yet district leaders went back to the well again in 2012 and this year. This time, voters got smart. They educated themselves. They recognized that they were being conned. Even some members of the bond oversight committee appointed by the school board couldn’t stomach this. This article appears in today’s West County Times. The hospital has been losing money for years. They need to reorganize their management staff. It’s clear that those in charge don’t know what their doing. NO TAX, EITHER PARCEL OR SALES TAX IS GOING TO BAIL OUT THESE IDIOTS!! A sales tax will only allow these idiots to continue to waste taxpayers money. They need to go into bankruptcy court where the bankruptcy court will take over the management of the hospital. One of the first things that the bankruptcy court is going to look at is the staffing. At present, the hospital has a staff of 900 employees with doctors making up 200 of those employees. That’s more people than all the kids that go to Helms Junior High School. What the hells going on here? SAN PABLO — Hoping to open new possibilities for saving at least a portion of Doctors Medical Center San Pablo, health care board officials announced Monday they would rescind their notice of closure to county health officials and instead pursue a plan to at least sustain the hospital’s 25-bed emergency department, the largest in West Contra Costa County. The plan, revealed Monday at a town hall meeting attended by more than 100 people, includes asking the county Board of Supervisors on June 17 to approve a $6 million loan against future property tax revenues to the health care district, Gioia said. That funding would sustain the hospital for about four months while health care district officials continue to appeal to other area hospitals and private foundations for funding for a “more sustainable model,” Gioia said. At the same time, the board has commissioned a poll gauging voter support for a countywide sales tax hike to fund public safety and public health-related services that could save the hospital, which runs an annual operating deficit of about $18 million due to a poor payer mix. “DMC suffers as a direct result of the nature of the population it serves, the elderly and the indigent,” said hospital CEO Dawn Gideon. Most of the 40,000 people who flock to DMC’s emergency department each year are covered by MediCare and MediCal, which pay low reimbursement rates. Better paying commercially insured patients in the area go to Kaiser Richmond and other regional hospitals. The Affordable Care Act, which includes deep cuts to MediCare reimbursement rates, has exacerbated the problem, Gideon said, costing the hospital another $2.8 million this year. “Each year DMC falls further behind,” Gideon said. Hospital officials are hopeful that the new plan, which could include significant reductions in hospital capacity or maintaining only a free-standing emergency room, will bring new funding to the table, particularly from other area hospitals that would be inundated with thousands of low-paying patients if DMC closes. “We have a high degree of confidence that we’re going to have some success,” with the new plan, said West County Healthcare Director Eric Zell. But nurses and doctors at DMC, who have held their own town halls in recent weeks and suggested they will take pay cuts to help save the hospital, were quick to decry any plan that would include deep cuts in services offered by the hospital. While Gioia acknowledged that a smaller hospital or free-standing emergency room would include “significant cuts” in DMC’s 900-person workforce, he said the possibility had to be explored. “The most possible outcome is a scaled down version of the hospital,” Gioia said. Monday’s meeting at San Pablo City Hall was held by the Contra Costa Health Services’ Emergency Medical Services Division as part of the legally-mandated process initiated whenever changes to hospital emergency services are proposed. It follows the failure of Measure C last month, a parcel tax aimed at saving the hospital that failed to get the two-thirds majority of voters required by state law. Two smaller parcel taxes were approved by voters in recent years, but those only narrowed the yawning deficit. Several residents and local political officials spoke out, urging the county to do more to sustain the hospital in its current form. Many had their own stories of family and friends who suffered heart attacks and other life-threatening emergencies and were treated at DMC over the years. Another common refrain was that the hospital’s struggles were typical of a county they said placed a low priority on the public health services to residents in West County, which is poorer and more ethnically diverse than other parts of the county. The hospital is the lone provider of advanced cardiac care for heart attack victims in West County, and its closure would leave the area with only 15 of the county’s 242 emergency room beds.